India is a home of rich spiritual traditions and philosophies. Yoga and Buddhism are the two greatest systems of philosophies given to humanity. The former expounded by Patanjali remained and lasted as pure tradition, while the latter when it was split into several schools. Zen was born from one such school called Madhyamika as it traveled to the far east. Though originated in India, the two are diametrically opposed in respect of theology, cosmology, methodology and technique. 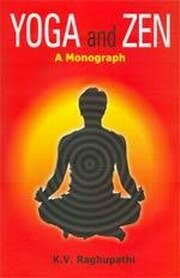 The concise monograph takes an insightful look into similarities and differences between these two systems which made a deep impact on human life. This small but invaluable study is considered as a rich contribution to the field of comparative study of philosophical systems and religions. Dr. K.V. Raghupathi (b. 1957) received his M.A. Degrees in English Literature in 1979, M.Phil. in 1982 and Ph.D. in 1997 from Sri Venkateswara University, Tirupati and PGDTE (Post graduate Diploma in Teaching of English) from CIEFL, Hyderabad. He began writing seriously in 1985. Since then he has published innumerable poems, articles and book reviews in various literary and cultural journals and magazines of high reputation, participated in seminars and conferences, presented research papers and delivered lectures and public talks on literature, language, yoga, religion and spiritual life. He has so far published six books in English verse: Desert Bloms (Kolkata, 1987), Echoes Silent (Kolkata, 1988), The images of a Growing Dying City (Kolkata, 1989), Small Reflections (Kolkata, 2000), Voice of the Valley (New Delhi, 2003) and Wisdom of the Peepal Tree (New Delhi, 2003). He is a recipient of several awards, notably, H.D. Thoreau Fellowship 2000 (Dhvanyaloka, Mysore), Michael Madhusudan Academy Award 2001 (Kolkata) and the Chosen Best Poet of 2003 by the Poetry Society of India, New Delhi and Poetry Chain, Mumbai. He lives in Tirupati and is lover of classical Karnatic Music. Bibliographic Information: viii+70p., Bibliography; Index; 23cm.